Lego Cufflinks. £8 from Jude's Jewels. Handmade, Retro, very fashionable, trendy and fun to wear. 2x2 Lego bricks in a selection of colours on sturdy silver plated cufflinks bases. 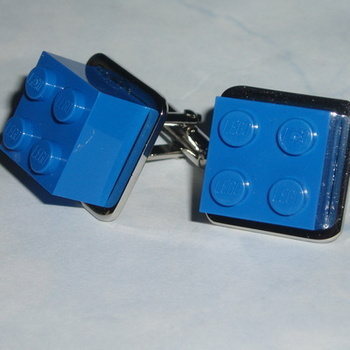 Lego Cufflinks will brighten the dullest shirt. Now with the option of adding a Swarovski Crystal to each Lego Brick for a little sparkle. I use new and re-cycled Lego Bricks. EMO, Kitch, Retro.